Electronics isn’t necessarily rocket science, a few hours careful planning and execution and you get a decent product and a great deal of satisfaction. Plus there is money saving to. These two views show the IC718 data interface, complete, on the right, and with the cover removed, on the left. 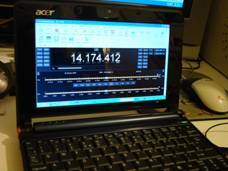 The Acer Aspire One running a piece of free software, - Ham Radio Deluxe. Possibly the best thing since sliced bread. Download it, try it, why not support it. I have spent some time updating this site as there is news of two new articles coming out. One in Practical Wireless, and the first for me an article published across the Pond in QST. I am particularly pleased with both articles as I believe they are achievable on a simple work bench and achieve amazing results if attention is given to each build. I am eager to receive comments regarding any article. In these circumstances you either get lots or no response at all. Either is good news, some people like it, some hate it. You can’t win all the hearts of people over to your side. I have included a web page on the QST article, comments to a new email address as shown below. For those people who were interested in the very old published pages of an HF auto ATU, this project hasn’t died. Due to the success of the VSWR meter I have decided to press on with the Auto ATU sometime in the future. Details as and when they are forthcoming about the project will be published here first.